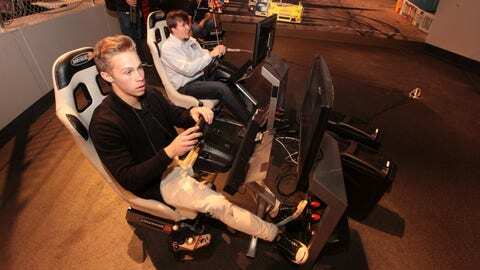 Dylan Kwasniewski (left) and Tyler Hudson (right) race on an iRacing simulator at the NASCAR Hall of Fame as past of their champion's week celebration. While the Sprint Cup Series Awards were held last week in Las Vegas, Nev., this week the NASCAR regional and touring series champions are celebrating their successful seasons in the heart of NASCAR country — Charlotte, N.C. 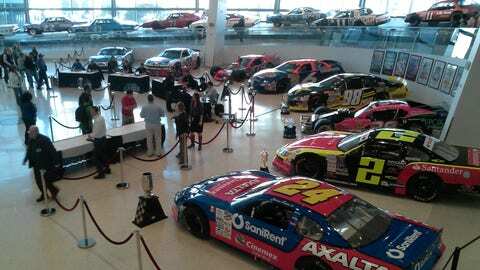 The NASCAR regional and touring series champions’ cars sit in the NASCAR Hall of Fame as fans meet the drivers. On Wednesday, the group of champions — made up of Dylan Kwasniewski (NASCAR K&N Pro Series East), Derek Thorn (NASCAR K&N Pro Series West), George Brunnhoelzl III (NASCAR Whelen Southern Modified Tour), Ander Vilarino (NASCAR Whelen Euro Series), Scott Steckly (NASCAR Canadian Tire Series presented by Mobil 1), Rodrigo Peralta (NASCAR Toyota Mexico Series), Lee Pulliam (NASCAR Whelen All-American Series), Ryan Preece (NASCAR Whelen Modified Tour), and Tyler Hudson (NASCAR iRacing.com world champion) — set up shop at the NASCAR Hall of Fame to sign autographs and compete against fans and media members on iRacing simulators. This is no simple video game, either. The iRacing simulator is one of the most accurate and realistic racing games around, enough so that NASCAR sanctions an online racing series and crowns a champion each year. So the champion racers should be tough to beat, right? Well, not exactly. Race fan Ricky Hardin, of Fort Mill, S.C., was able to take top honors in the competition, beating Ryan Preece in the penultimate race in Sprint Cup Series cars at Charlotte Motor Speedway. The event was not exclusive to Sprint Cup Series cars and tracks, however. 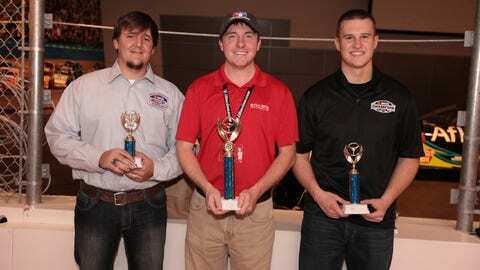 Ricky Hardin (middle) shows off his trophy for winning the iRacing event at the NASCAR Hall of Fame. Ryan Preece (right) and Tyler Hudson (left) finished second and third. While some of the champions were fast right away, others, particularly Dylan Kwasniewski, struggled to get the hang of the tricky system. The young up-and-coming talent said he competed on iRacing a few times in the past, but does not use it regularly. Preece, on the other hand, discussed with fans the similarities of racing a modified at New Hampshire Motor Speedway in real life and on iRacing. For iRacing champion Tyler Hudson, the NASCAR Hall of Fame simulators provide a "dumbed down" version of the system, with no ability to adjust the car. Yours truly even got the chance to compete in two races, one in a K&N Pro Series car at Dover International Speedway, the other in a modified at Stafford Speedway. As mentioned, iRacing is not as easy as it looks. The steering is very sensitive, you have to get off the gas and on the brake at the right moment, handling is key. Apparently, so is pit road speed.In my race at Dover, I was busted for speeding on pit road while trying to make repairs to my car not once, not twice, but three times. I think I’ll stick with my classic ‘NASCAR 98’ version of racing games on my Playstation 2.